I made these rice and tempeh stuffed peppers a couple of weeks ago, and I didn’t really intend to post them. The meal was one of those “clear out the fridge” concoctions, an effort to use up rice and the block of tempeh that had been hiding in my freezer for a while, as well as some frozen veggies. It was so good that Steven suggested I post it, and I couldn’t argue. 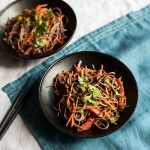 This is a meal that turns simple pantry ingredients and bell peppers into something special, and it’s packed with plant protein, too. 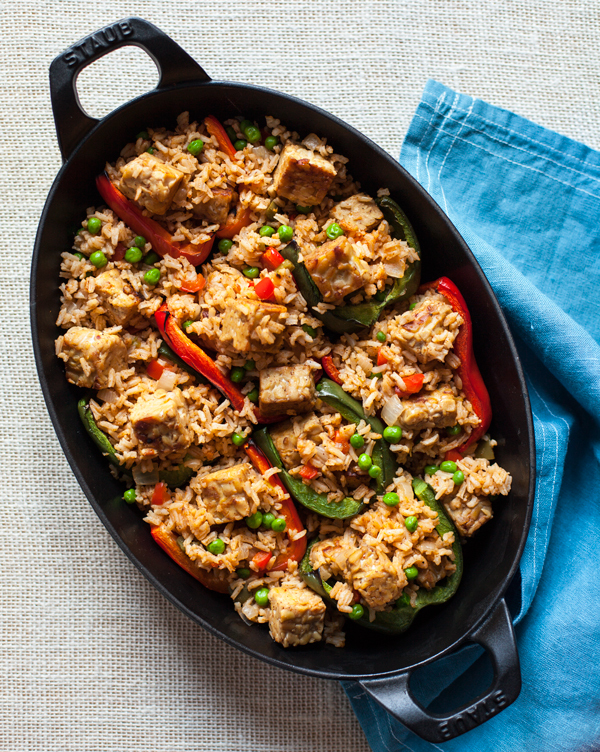 If you make the rice ahead of time, then this could certainly qualify as a “hurry up vegan” dish. And if you prepare it while you’re home doing other stuff, as I did, it actually comes together without too much fuss. One thing I realized while making the dish is that, in spite of the pretty presentation that the peppers create, you don’t actually have to stuff peppers in the first place. 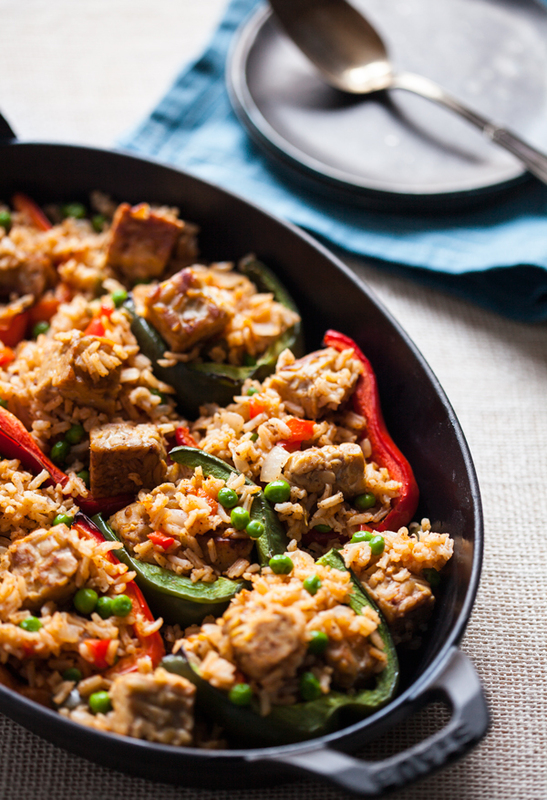 The rice here is pretty tasty on its own, so if you’d like to call it a variation on dirty rice with tempeh, go for it. It’s a complete and satisfying meal just as it is. But if you’d like to dress the simple ingredients up a bit, and transform this from a speedy weeknight supper into something that you could easily serve to neighbors or friends, try the whole stuffed pepper thing. 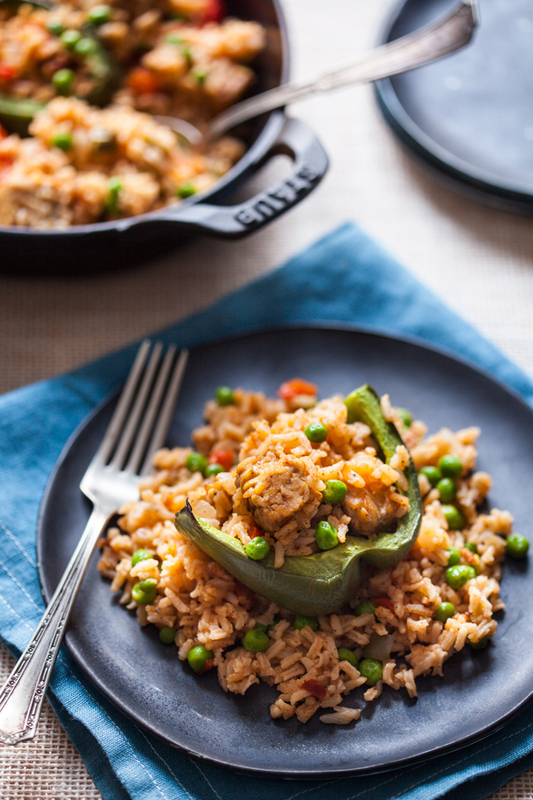 It’s a fun way to serve the rice and pack more fiber and antioxidants into the dish. As far as added veggies go, peas and corn are my suggestions–both of which could be fresh or frozen. Stirring in chopped broccoli florets, greens, shredded carrot, or chopped tomatoes would also be delicious. The beauty of a rice dish like this is that it’s a chance to use up what you’ve got, so don’t hesitate to modify as desired. 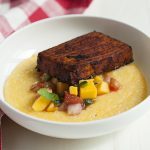 If you don’t like tempeh, or you don’t have any, try using tofu instead, or even skillet-roasting some chickpeas in the lime juice and tamari marinade. In a medium sized pot, heat two teaspoons of of the oil. Add the onions and pepper. Saute the vegetables, stirring occasionally, for 5-7 minutes, or until the onions are soft and clear. Add the rice, salt, paprika, cumin, chili, cayenne, and two tablespoons of the lime juice to the pot. Give everything a stir in order to coat the rice and vegetables evenly with the spices. Add the water and bring the mixture to a boil. Reduce the heat to a simmer, cover the pot, and simmer for 20 minutes if you're using white rice, 35-45 minutes if you're using brown--or until the rice is tender and has absorbed all of the water. Turn off the heat. While the rice cooks, preheat the oven to 350. Lay the pepper halves on a foil or parchment lined baking sheet and bake for 15 minutes, or until gently browning at the edges and tender, but not yet collapsing. Remove the peppers from the oven (but leave the oven on). Whisk together the remaining two tablespoons of lime juice, tamari, and crushed red pepper in a medium sized bowl. Add the tempeh cubes and toss them evenly to coat. Heat the remaining two teaspoons of oil in a small frying pan or skillet. Add the tempeh cubes and all of the liquid in the bowl to the pan. Allow the tempeh cubes to brown gently on all sides, watching them closely and flipping them as needed (about 8 minutes). 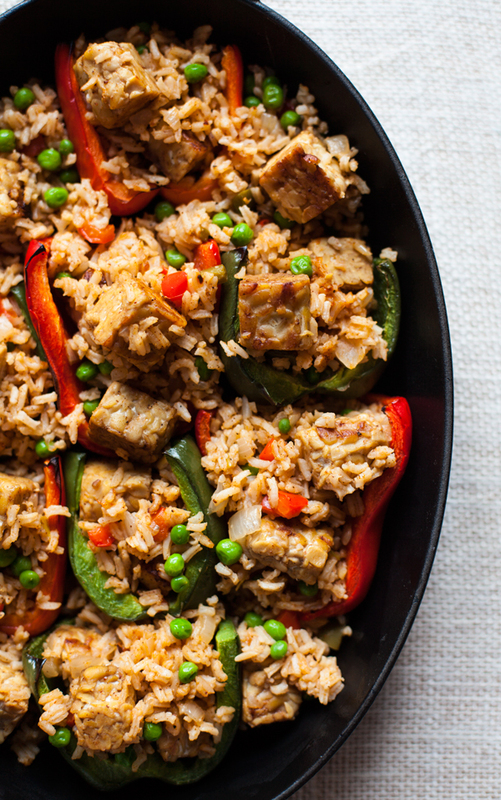 Mix the tempeh and peas or corn into the rice. Check the rice for seasoning and add salt, pepper, and spices to taste. 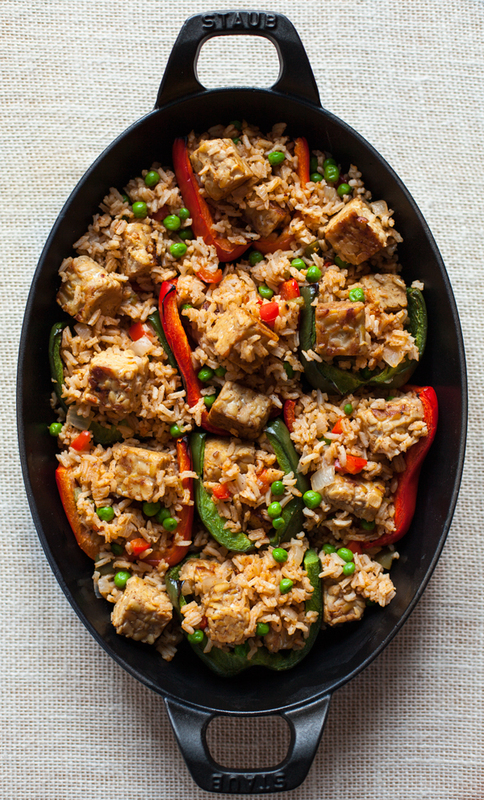 Scoop the rice mixture into the pepper halves and place them in an oiled 7 x 11 or 8 x 13 casserole dish or baking pan. Distribute the remaining rice + tempeh mixture around the stuffed peppers, so that it bakes with them and gets a tiny bit crispy and warm. Add any toppings you like. Pop the baking pan in the oven and bake for 15-20 minutes, or until the peppers are totally tender. Serve. A final, added bonus of the recipe is that leftovers keep well, and can even be frozen for a couple weeks if you like. To serve the peppers and round out the meal, I recommend a nice, big salad–maybe something with romaine and my smoky avocado and cumin dressing to pick up the Mexican flavors! Enjoy the recipe, everyone. 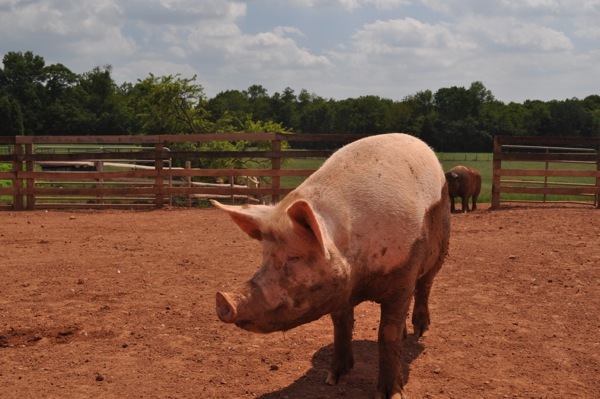 A little sad news before my sign-off: remember Hamlet, my sponsor pig at Poplar Springs Animal Sanctuary? I found out today that he died about six months ago; heart trouble. I feel terribly because I hadn’t visited in so long, but I’m taking comfort in the fact that his last years were spent in a loving, safe, peaceful environment. 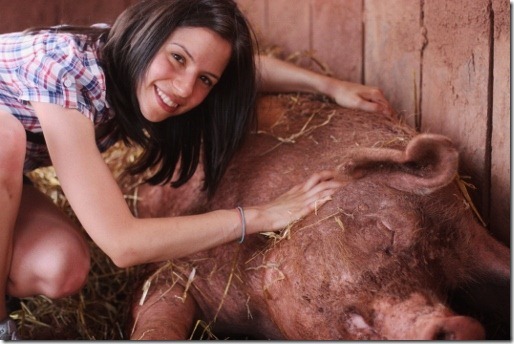 Farm sanctuaries do such an incredible service. I can’t tell you how much it meant to me to sponsor Hamlet, or how much I look forward to supporting the care of another animal. If you’re looking to do something meaningful for animals, I really recommend finding a farm sanctuary near you and paying a visit. You never know which cow, pig, turkey, goat, chicken, or goose is going to touch your heart. Oh my goodness! Of course that’s what I meant. Sorry Meg — I corrected. Enjoy the peppers! Aw, RIP Hamlet. So glad he got to live with loving, devoted caretakers. And I can’t wait to (e-)meet the next guy or gal you sponsor. So, so sorry to hear about Hamlet. I love this post. Thank you for all you do for your CR readers! Seriously! awww what a happy little –er big– piggy! 😀 gorgeous dish! Just made this tonight. I only had half a pepper since I sautéed a big bunch of kale. It hit the spot and I have left overs for all week. This recipe was very timely as I had just bought tempeh and brown rice. Thanks! I might add a bit more paprika next time. Each to their own taste, right! 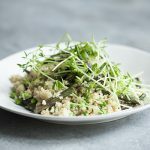 Love the sound of this recipe – especially the addition of tempeh. 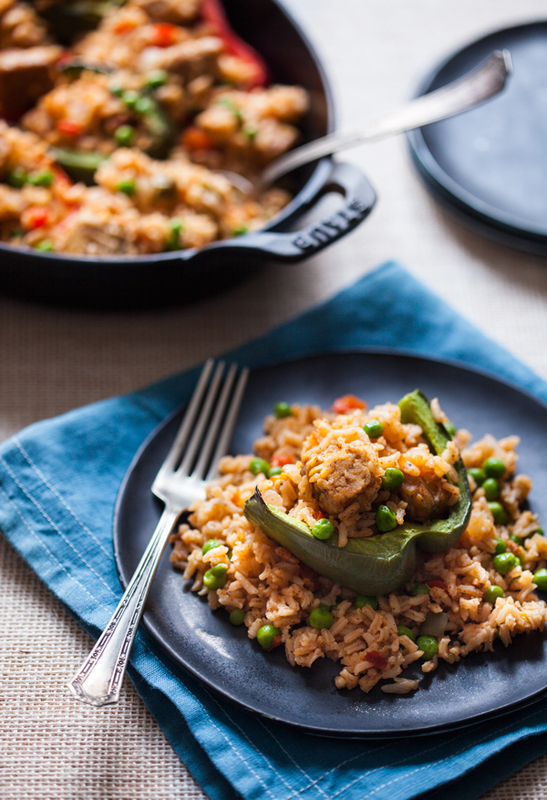 I’ve made stuffed peppers before, but just with rice and veggies – added protein is a great idea!